Huntsman Heroes is a community of runners (and walkers), cyclists, stair climbers, and skiers who are all making a meaningful impact in the fight against cancer. From beginners to seasoned athletes, these team members take on a variety of endurance challenges while raising money for cancer research at Huntsman Cancer Institute. Because many of these fundraisers participate in multiple events concurrently, Hunstman wanted to provide their Heroes with an easy way to view their progress, fundraise, and manage their peer-to-peer events. We created a completely responsive campaign landing page that provides a single point of entry for fundraising participants – complete with real-time leaderboards, participant counts, and campaign fundraising totals. This allows participants access all of their different dashboards, toolkits, and training materials, as well as manage their fundraising impact and participation across all of their P2P events. ​​​​​We are honored to help Huntsman increase support through P2P fundraising so they can continue to fight cancer and improve the quality of life for cancer patients, survivors, and their families. 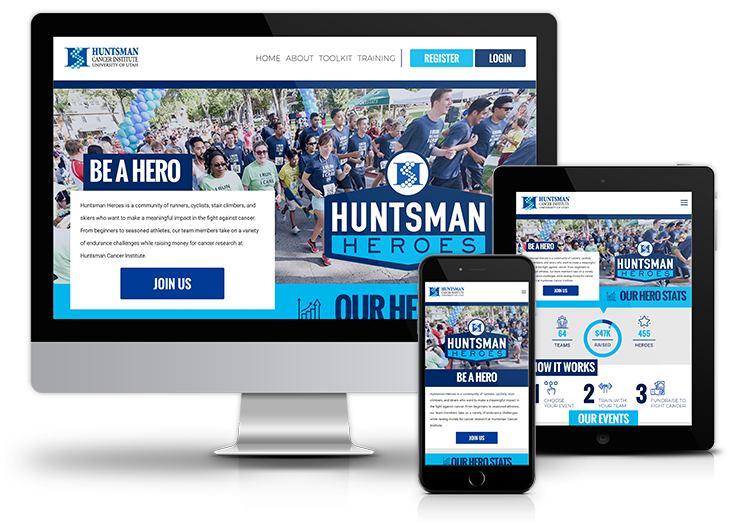 Learn more about the Huntsman Cancer Institute at their website, and support Huntsman Heroes by visiting their 2019 P2P Site. Let us know how we can take your P2P campaign to the next level!